The ‘libero’ is an evocative term in the Soccer vocabulary. It describes the free role played from a defensive position occupied by outstanding players like Germany’s Franz Beckenbauer, Ronald Koeman from the Netherlands, and Gaetano Scirea and Franco Baresi of Italy. In many ways, the ‘libero’ was the main man of Football, at least as it was played from the late 1960’s up until the mid-1990’s. Originally conceived as a safety measure, with an extra man ready to ‘sweep up’ mistakes or breaks through the four-man defensive line, it has evolved into something far more complex and attack-minded. The spare man in defence could also create opportunities with the pass, a privilege of his ‘long’ view of the field from the back. By 1996, he was also running past his own midfield to score goals and join up with the attack, like Lothar Matthaus, or Matthias Sammer for Germany at the 1996 Euros. Eventually the libero died out of the professional arm of the game with the demise of man-marking, although the ideas behind it live on in the defensive midfield role played by the likes of Sergio Busquets at Barca and for Spain – dropping into the space between the two centre backs, who can then shift wide and allow the full-backs to drive upfield and become wingers! The closest approximation to the libero in modern professional Rugby Union is the defensive role performed by the scrum-half. The halfback will typically be asked to play more roles than other defenders. He will ‘sweep’ about five metres behind the defensive line, organizing the defenders around the breakdown as it forms; he will mark the zone between the defensive line and the backfield to guard against shorter length kicks; he can drop all the way into the backfield to help out the full-backs and wings and initiate counters – a role made particularly popular in French rugby by the likes of Dmitri Yachvili and Morgan Parra. 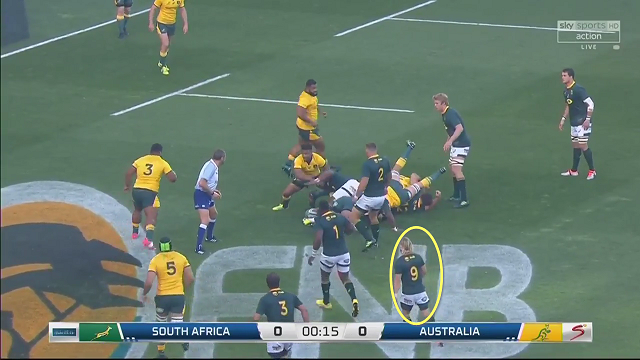 Even more developments in the use of the scrum-half as the free man on defence have occurred through players like South African Faf de Klerk. 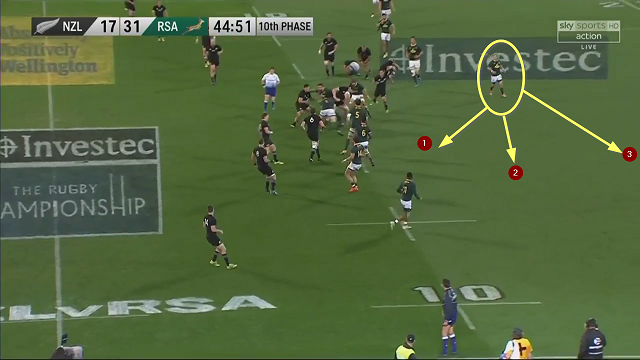 With his non-stop motor, De Klerk is not only expected to fulfil the traditional roles of the number 9, he is also required to transition on to the attack as the spare man. Let’s take a look at some of the roles played by de Klerk in the 2018 Rugby Championship. De Klerk played a key part in South Africa’s win over New Zealand at the Westpac stadium in Wellington in the fourth round of the tournament. 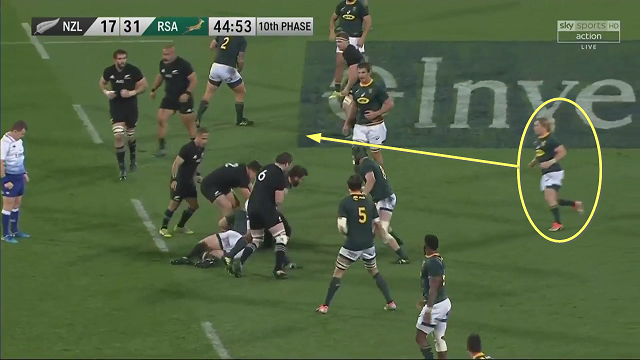 From this post, De Klerk can either help sweep up any tackle breaks made (#1), he can cover the shorter attacking kicks (#2), or he can drop back to join up with the backfield defenders against the deeper tactical kicking game (#3). Like a good outside linebacker in American Football, the most destructive blitzes come from the blind-side of the passer. From these positions, disruption almost inevitably means ‘turnover’. De Klerk gets an arm in on Aaron Smith’s passing action and forces a fumble. The role of ‘libero’ has changed out of all recognition since it was first introduced in Italian football in the 1960’s. Now the man playing the free role has to be able to fulfil a number of tasks, both with and without the ball. Rugby coaches like Eddie Jones, Joe Schmidt and Steve Hansen are always looking for crossovers from more mature professional sports like Soccer and American Football, and some of the principles of the libero role now apply to the scrum-half in Rugby Union. He can be found fulfilling a number of different defensive duties – organizing the defence near the ruck, sweeping up short kicks, helping out on the counter from the backfield proper. If he is Faf de Klerk, he will also be attacking the key opposition decision-makers on the blitz – whether he is playing for his country South Africa, or his English club Sale Sharks. As the great Beckenbauer himself once said, “Sometimes you have to shoot from the second row, that’s Football. You have to be a bit more flexible.” That’s rugby too, in the modern world. 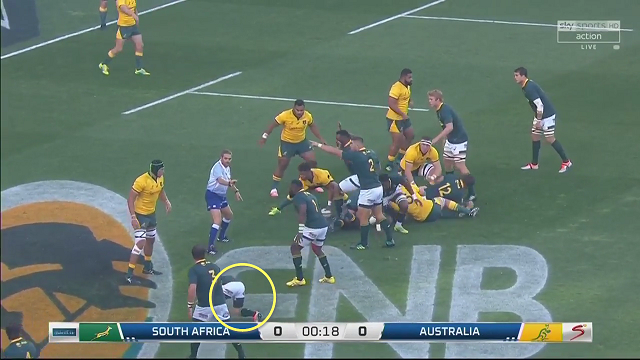 The perception of ‘negative play’ in rugby is often associated with kicking the ball. The idea that a team which can no longer think of anything positive to do with the ball, kicks it away instead. Analyst Nick Bishop looks at how kicking is now about creating opportunity for the offence, rather than simply to move the ball off the field of play.